The Bar Professional Training Course (BPTC) student emerged victorious in an intense competition. Anirudh Mandagere, studying on the City Law School’s Bar Professional Training Course (BPTC), won First Prize in the Senior Moot 2017 on 11th May at the United Kingdom Supreme Court. He won £800 and was presented with the Senior Moot Trophy. The case for City’s premier postgraduate moot centred around issues of compensation and the frustration of a property lease. 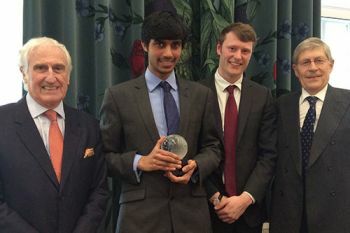 Anirudh and his team-mate James Hamblen (Runner-up and winner of £500), who argued for the Respondent, faced Lucile Taylor and Jonathan Scott, who argued on behalf of the Appellant. The judges for the evening were Barry Denyer-Green, a Barrister at Falcon Chambers (and writer of the moot problem), and Right Honourable Lord Gill, the retired Lord President and Lord Justice-General of Scotland, who was previously a member of the UK Supreme Court. All finalists won £325 each. Anirudh, originally from Stockport, is the holder of a First Class honours degree in History from St Catherine's College, Oxford University. He said the moot made for a great intellectual challenge because it incorporated such a wide breadth of law. "Given the fierce nature of the competition, I was stunned when the judges announced that I had won." "I would like to thank Falcon Chambers for writing such a stimulating problem, as well as City and my tutors for their support throughout", Anirudh added. The Senior Moot offered the chance for 64 students from various programmes in the law school to compete. The competition this year was keenly contested and I commend all the finalists on their achievement and hard-work not only in the final but throughout the competition. The Supreme Court offered the perfect location for our final and was well attended by members of teaching staff as well as family and friends of the finalists. The standard of advocacy in the final was extremely high and the judges commented that across all four competitors not a single word was wasted. Congratulations to this year's winner, Anirudh Mandagere. I would like to thank members of the teaching staff on the BPTC who have assisted with judging in earlier rounds of the competition. And thanks to our final judging panel comprising Barry Denyer-Green and Rt Hon. Lord Gill.